TORRANCE, Calif., Dec. 6, 2018 /PRNewswire/ -- On January 1, 2019, American Honda will ring in the New Year and its 60th anniversary celebration with the lead float in the 130th Rose Parade® presented by Honda. The company's float entry, "Celebration of Dreams," will pay tribute to Honda's heritage in the U.S. and its dreams for the future. The 25-foot tall float will be shaped like a giant birthday cake to mark the occasion, complete with special "candles"—60 members of Historically Black College and University (HBCU) marching bands. The band members' schools recently participated in the Honda Battle of the Bands, an annual showcase created by Honda as part of the company's commitment to the HBCU community and music education. The floral confection will also feature a re-creation of the company's first Los Angeles storefront. The float will be punctuated by vibrant color, music and video, with screens that share the story of American Honda's commitment to the community. "For 60 years, Honda has celebrated the power of dreams and has been committed to making the communities where we live and work better places for future generations," said Steve Morikawa, vice president of Corporate Relations & Social Responsibility, American Honda. "We look forward to celebrating this anniversary with our customers while continuing to provide products and services that will bring them joy for years to come." Honda Super Cub. The product that marked American Honda's debut and represents Honda's motorcycle heritage. Environment. This unit will showcase a floral re-creation of the 1975 Honda Civic CVCC, the vehicle that was the first to satisfy U.S. Clean Air Act standards without the use of a catalytic converter. It serves as a reminder of Honda's mission to reduce the impact of its products and operations on the environment. Safety. Honda believes in Safety for Everyone. To visually demonstrate this, the float unit will feature crash test dummies surrounded by an arch with five stars. The arch symbolizes the top crash safety rating available in the National Highway Traffic Safety Administration's NCAP program, which top rating has been earned by many Honda and Acura vehicles. American Manufacturing. Focused on American Honda's manufacturing presence, this float will highlight the 25 millionth vehicle built in the U.S.—and one of the best-selling vehicles in its vehicle lineup—the Honda Accord*. Future. Honda believes in the Power of Dreams and is fulfilling its dreams of flight on the wings of HondaJet. In keeping with Honda's commitment to the environment, the float will be powered by a specially configured low-emission, Honda hybrid powertrain. The Parade's theme banner float will also be powered by Honda hybrid technology. In addition to the float, the 2019 Honda Insight will be the Parade's Official Pace Car. The Insight offers exceptional fuel economy ratings and advanced standard safety features and joins the Clarity series and Accord Hybrid as the fifth Honda electrified vehicle introduced in the past year. The 2019 Acura RDX will serve as the Sound Car. This third-generation RDX is the first to be designed and engineered in America, with styling design conducted in the Acura Design Studio in Los Angeles, California, and development and manufacturing conducted in Ohio. The 130th Rose Parade® presented by Honda will be broadcasted at 8:00 a.m. Pacific on Tuesday, January 1, 2019. Honda and the Tournament of Roses® have worked side by side for nearly six decades to bring entertainment and tradition to people around the world. Honda became the first-ever presenting sponsor of the event in 2011 and the Opening Show sponsor in 2016. Honda first collaborated with the Tournament of Roses in 1961 to provide two-wheeled vehicles for 1962 Parade operations. 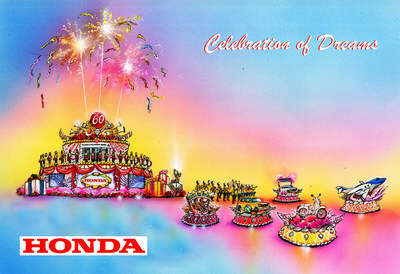 Honda has been a float participant in the Rose Parade since 1977, and has provided the official Tournament of Roses vehicle since 1994. Honda continues to supply two-wheeled vehicles and also provides side-by-side (multi-utility) vehicles for Parade operations. As presenting sponsor, the Honda float is the first in the Rose Parade and showcases the theme. As a result, it will not be considered a commercial entry and will not compete during the judging process. Prior to becoming presenting sponsor in 2011, Honda floats won awards in 15 of the previous 16 years. Honda established operations in America in 1959 and today employs more than 40,000 associates in the development, manufacturing, and sales of Honda and Acura automobiles, Honda power equipment, Honda powersports products, the HondaJet advanced light jet and GE Honda HF120 turbofan engines. Based on its longstanding commitment to "build products close to the customer," Honda operates 19 major manufacturing facilities in North America, working with more than 650 suppliers in the region to produce a diverse range of products for customers locally and globally. In 2017, more than 90 percent of the Honda and Acura automobiles sold in the U.S. were produced in North America, using domestic and globally sourced parts. Honda also operates 14 major research and development centers in the U.S. with the capacity to fully design, develop and engineer many of the products Honda produces in North America. The Tournament of Roses is a volunteer organization that hosts America's New Year Celebration® with the Rose Parade® presented by Honda, the Rose Bowl Game® presented by Northwestern Mutual and a variety of accompanying events. 935 volunteer members of the association will drive the success of 130th Rose Parade themed "The Melody of Life," on Tuesday, January 1, 2019, followed by the 105th Rose Bowl Game. For more information, visit www.tournamentofroses.com. Like us on Facebook and follow us on Twitter, Instagram and YouTube. * Using domestic and globally sourced parts.